The Aries B20 20K RAM expansion adds 20K shadow RAM to the BBC Micro. It consists of a board with 10 x 2K RAM chips and a managing ROM. 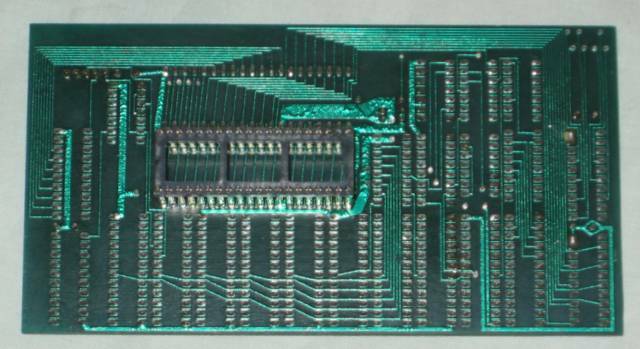 The board plugs into IC1 on the BBC Micro's motherboard. The 6502 CPU is relocated to the socket on the Aries B20. The ROM plugs into one of the BBC Micro's sideways ROM sockets. The Aries B20 provides an additonal 20K RAM which is mapped from &3000-&7FFF in parallel with normal memory. The Aries ROM intercepts all references to the area above &3000 (excluding the screen) and diverts them to the B20 RAM. This is entirely automatic and provides a useable memory of 28K regardless of screen mode. 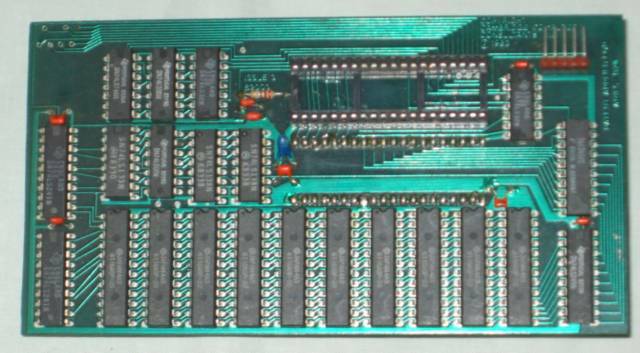 The Aries B20 can be used with the Aries B12 Sideways ROM board where it replaces the B12 Adapter board and is connected to the B12 via the 5 pin header (see picture 1 top right. Acorn User published a review of the Aries B20 in April 1984 titled A 20K RAM boost for the 'B' with a Unique Paging System . I do not have a copy of the Aries B20 ROM.